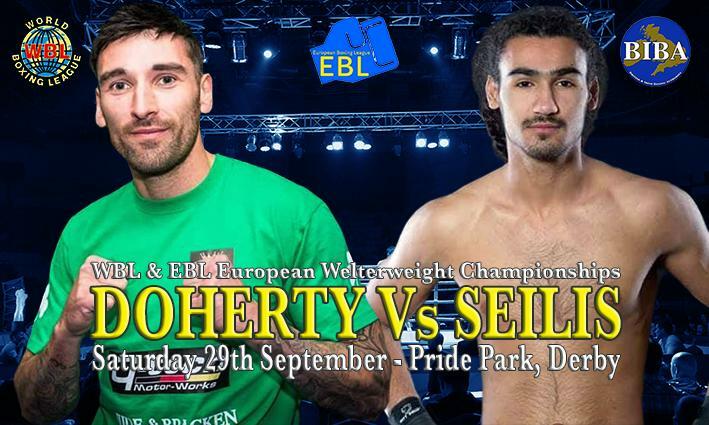 Derby's unbeaten Welterweight prospect Ross Doherty appears in confident mood ahead of his first Championship contest, against Latvian Gvido Seilis this coming Saturday, the 29th September, on the Dan Gray promoted event at Pride Park in Derby. Doherty has been mighty impressive, since bursting on to the professional scene, with a solid points victory over Belfast's Marty Kayes back in September 2016, which he followed up with a series of solid points victories over the past two years, culminating in a sensational performance, and yet another shutout points victory, against another tough Latvian, Grigorijs Dunecs, in an eight rounder back in April this year. "My training camp has gone very well, Dan Gray pushed me to my limits in training as well as arranged some seriously top class sparring for me. "My opponent has changed, I don't know too much about Gvido Seilis, other than he seems a very tough lad. Would normally have video footage of the opponents fights in plenty of time, which helps in us to adapt to the opponent's style, however not the case this time, but we're not worried, the camp was that good. "We know we are up against it, but I'm feeling confident I've got what it takes to do what is needed to bring those title belts home." There are also two non-championship contests featured on the event, exciting Super Bantamweight Emily Pugh makes her second pro outing against Latvia's Veronika Sirajeva and Leed's Super lightweight Jack Jones makes his professional debut against Dundalk, Ireland's Michael Kelly. For interviews or further information please contact Promoter Dan Gray on 07522 401454.